I spent most of the weekend re-doing the presentation boards for my science fair project. I won the “grand prize” in the building science fair, so I am taking my project to the North Dallas Regional Science Fair next week. At the regional fair, the rules say you can have a much bigger display than our school allows, so I added more data tables and larger pictures. This is my first time to enter a regional fair. I’ll let you know how I do! 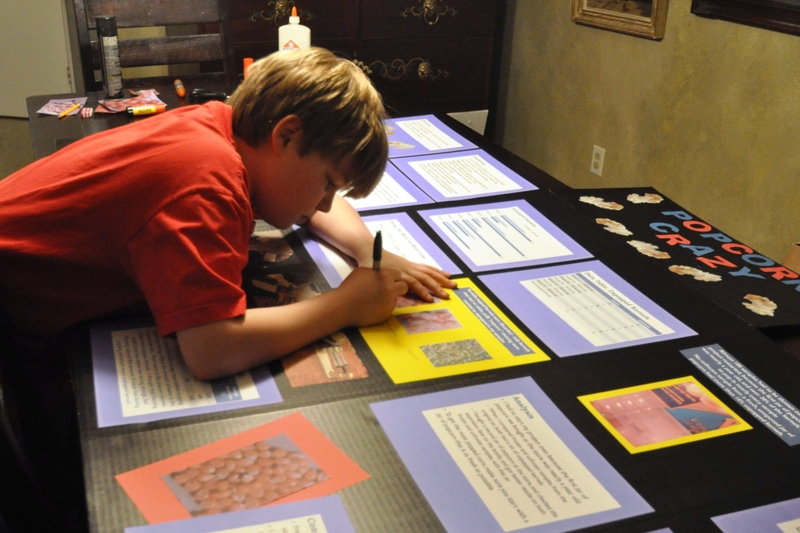 There’s a lot of work in a good science fair presentation! Wow — just got back from delivering my boards to the fair. It’s huge, and there are a lot of great projects there. There is even another 5th grade project on how to store popcorn to make more kernels pop. Some of the projects were really great. I can’t wait to see who wins tomorrow! A couple of things made me mad, though. I saw several projects that didn’t follow the rules. Like there was one where the kid’s face is visible in the photographs. The judge who was checking projects in put a round sticker over his face so you can’t tell who he is, but that shouldn’t have been allowed in the school fair because it’s against the rules to have anything identifying on your boards. Some of the projects were HUGE. One girl had this gigantic presentation that’s nearly 5 feet tall, and 40″ wide. The height is within the rules, but the width is supposed to be limited to 30″. But the judge checked it in. What made me mad is that the girl was standing around listening to music while her mother assembled her boards for her. Then the mom went over to another table, took off her shoes, climbed up on it, and started assembling her son’s presentation, too. While she was doing that, the boy was wandering around playing with everyone else’s projects. Nobody said anything, but it made me wonder whose project it was — the kids or the mom’s. Don’t get me wrong, the person next to me might win because the project looked really interesting and there was a lot of science in it. Here are some pictures of a few of the cool 5th grade projects I saw at regionals. Wonder what will win? We’ll find out tomorrow! Very Nice Blog, P.S. the red project in the bottom middle is mine and I got an honarable mention, working hard this year to win again in Plano! Hope to see you at the Regional Fair again this year! I didn’t place last year…so I started earlier this year. I saw yours and remembered that was my second idea! !